The mbedR3uino is a vertical shield adapter for the mbed prototyping platform. 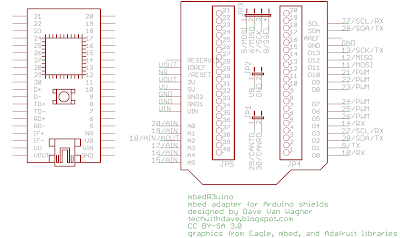 It provides compatibility with standard Arduino shields including the pins added to Arduino Uno R3 to make shields more independent between main boards. This is the project I wanted three years ago. Finally the need, inspiration, materials, and dependent projects converged. 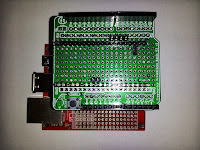 The ability to easily add pluggable hardware to the mbed had been demonstrated when I created the In-between Shield for mbed which plugged into the mbed workshop board adding flash memory to the mbed which plugged into the shield. 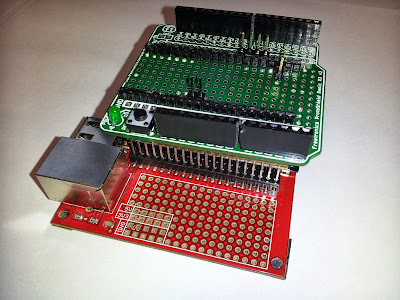 I have developed a number of prototype shields for Arduino using a ProtoShield that have been compatible with my various Arduinos, Netduinos, and other development boards providing plug compatibility with Arduino shields. With the addition of the new R3 pins: SCL, SDA, IOREF some more platform independence has occurred allowing the shield (or at least its I/O) to run at the same voltage as the target platform, and a standardization of the location of the I2C pins. The SPI pins which were originally reserved for ICSP or initial programming of the Arduino also became a standard. 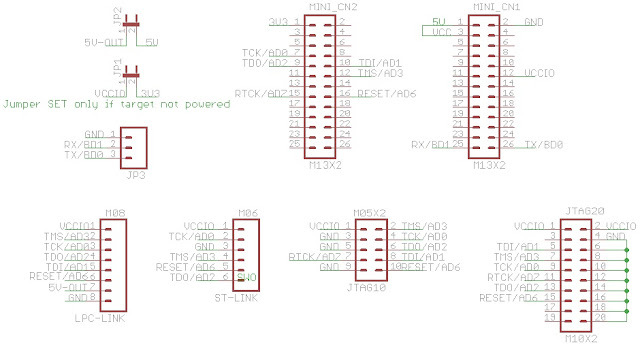 I opted to skip the SPI/ICSP pin compatibility and stick with the Uno SPI pin layout for simplicity; a future version should include the SPI/ICSP pins in their expected location. 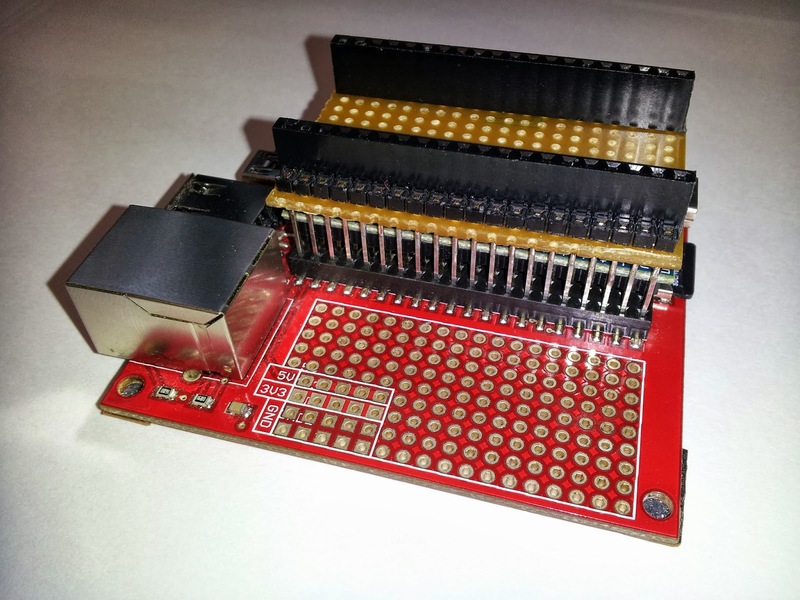 An R3 version of the ProtoShield was found here and I had seeedstudio build the PCBs. 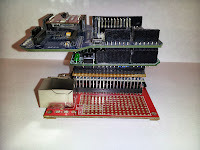 The mbedR3uino is named because mbeduino was already taken. Inserting the R3 in the name gives it some uniqueness while expressing its meaning. The adapter consists of two pluggable pieces. The first plugs into the workshop board above the mbed providing a footprint identical to the mbed. Components were added to the ProtoShield to plug it into the first piece, and wire the connections to the Arduino R3 headers. The result is that Arduino shields can be connected to the mbed. 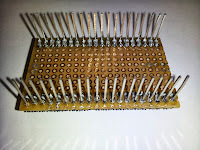 Standard height 0.45" header pins were used to connect the ProtoShield to the above mbed adapter. The above mbed adapter used taller 0.7" header pins so the PCB barely clears the height of the mbed, only touching the mini USB socket. Since my prototyping boards have solder terminals only on one side, and to keep them clean looking I try to solder only on the bottom, hidden from view, I used needle nose pliers to push the pins so the plastic is flush with the top of the pins, and then carefully solder the pins from the bottom of the board not getting them too hot or the pin could waver out of place. Once all the pins are soldered into place they hold very securely. Note that the mbed workshop board or equivalent is required. It already provides SD, Ethernet, and USB connectivity. I have a revA board which pin 9 is held high to 3.3V (intended for SD card detect? ), so to allow it to be used for the UART, I cut the trace on the workshop board. 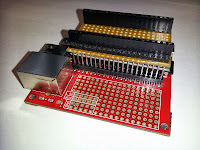 An alternative to using the workshop board would be to have dual row headers and connect the columns for all pins 1-40, as done in my mbed Text LCD development board. 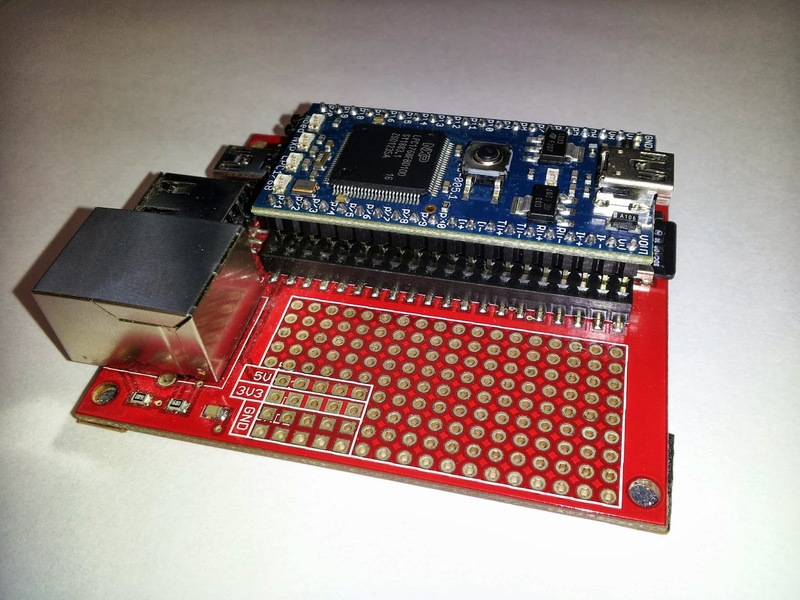 It is relatively easy to also solder a USB B connector, and an Arduino shield can be used for an SD card. 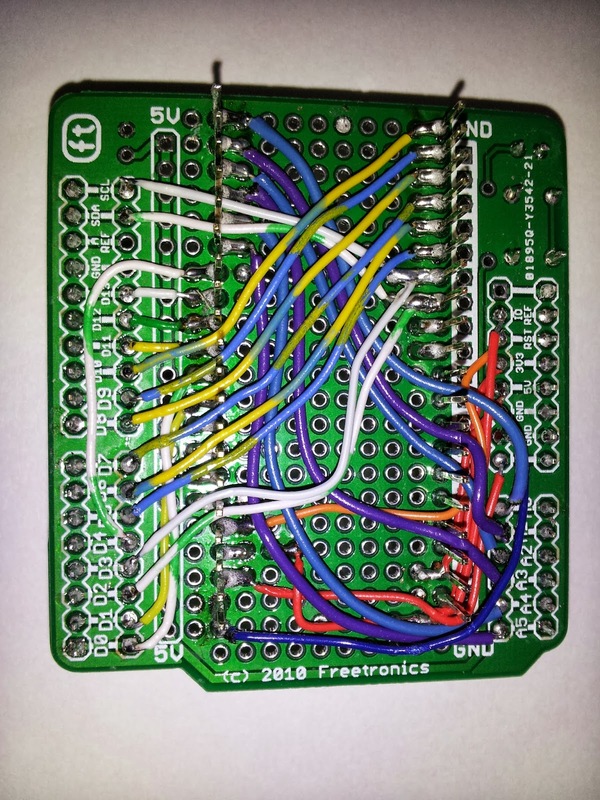 Connecting an Ethernet jack directly to the mbed can be done using a breakout board. 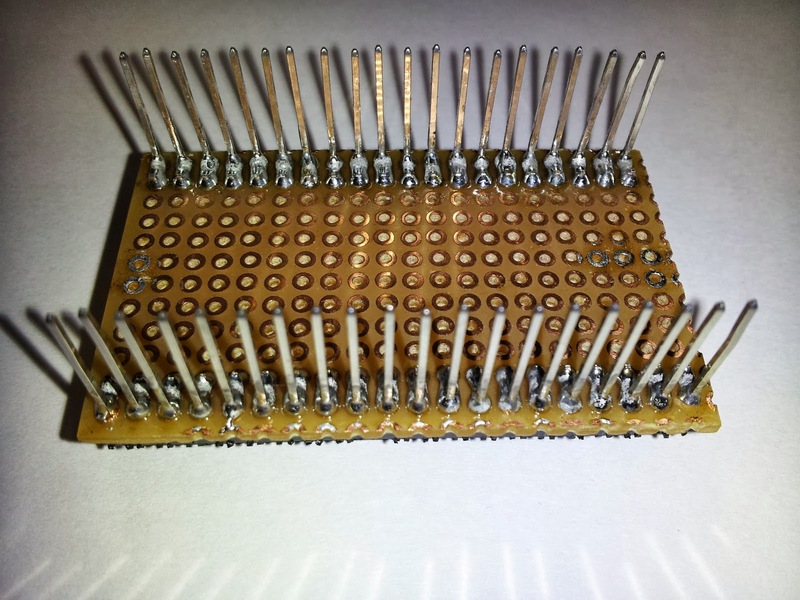 All the available pins on the mbed are either connected to the Arduino headers, or a few are broken out for additional expansion: since the workshop board already uses pins 5-8, they were left as an expansion; CAN and battery lines are implemented as jumpers for expansion. Analog pins and power pins are where they should be, one UART is wired to D0/D1 for Arduino compatibility, and one SPI is wired for original Uno compatibility (D13-D10). One pair of I2C pins are in the new R3 location, and the same pins are also wired to the same location as done with the Leonardo: D2/D3. The remaining D14 and PWM pins are wired to the remaining Arduino header pins. 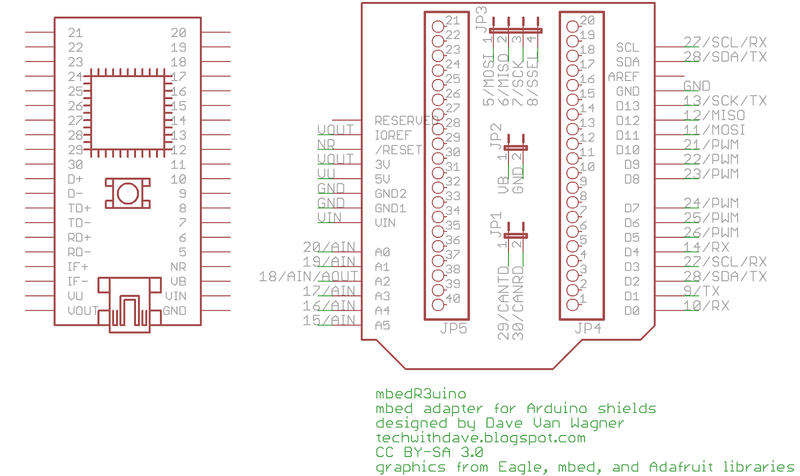 The schematic below shows how I chose to map the pins between the boards. As referenced in my JTAG Adapter post the OpenOCD project is an open source JTAG program and set of drivers. Professional JTAG programmers can commonly cost US $100 and up (some are thousands), and are often proprietary to a specific development toolset. Open source and open hardware efforts have made JTAG available at much lower cost and at least works with open source development toolsets such as gcc/gdb and Eclipse, as well as some commercial offerings that are built on Eclipse. Olimex has collected these open source development toolsets with OpenOCD and created a single installer called Olimex OpenOCD Development Suite for use with their development boards and their JTAG programmer. Installing their suite is one of the easiest ways to get an ARM gcc toolchain installed on your system with an IDE and JTAG programmer. Their toolset includes OpenOCD, Eclipse, gcc/gdb, and Zylin Embedded CDT. 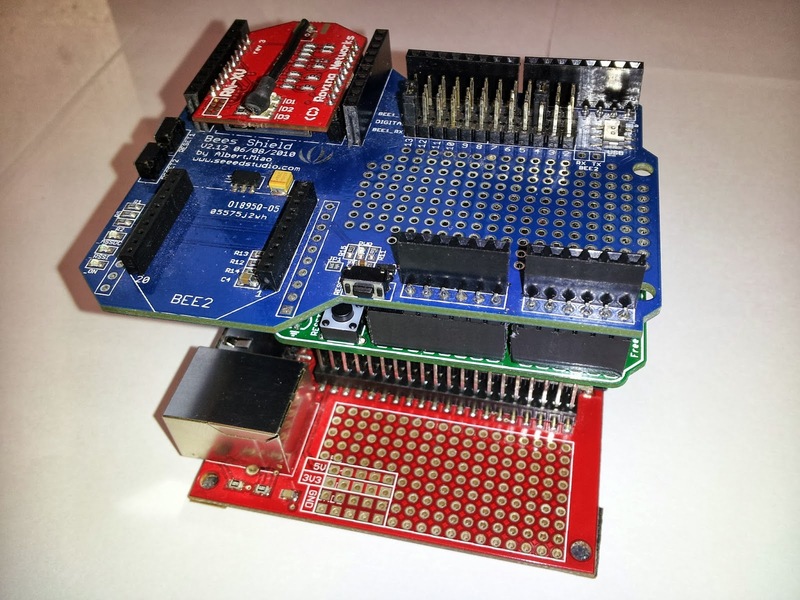 Sample projects are provided for some of their Atmel, STM32, and NXP (LPC) boards. I found that I needed to perform slight revisions their OpenOCD scripts included in at least the SAM7-P256-cdc_FLASH project because they were out of date. Once that was done, I was using my JTAG adapter with their ARM7 board performing programming and debugging. This suite and examples can be leveraged to target other boards. OpenOCD can also be used directly from the command line to make a connection with a board, and then use telnet to issue commands (see User's Guide) to direct it. From the command line you can verify and discover commands to issue to your board. In the following examples I will use my JTAG programmer to talk to the STM32F4Discovery board. I have a breakout board for this development board that includes a JTAG socket. I have disconnected the jumpers on the STM32F4Discovery for its onboard ST-LINK/V2 debugger, so I can use my JTAG programmer instead. This file was not tested with real interface, it is based on code in ft2232.c. so it could be marked as working or fixed. Then I open a telnet window to localhost port 4444. From here I can issue various commands to OpenOCD to perform JTAG commands. There you have it, some example OpenOCD commands. Hope you learned something useful. 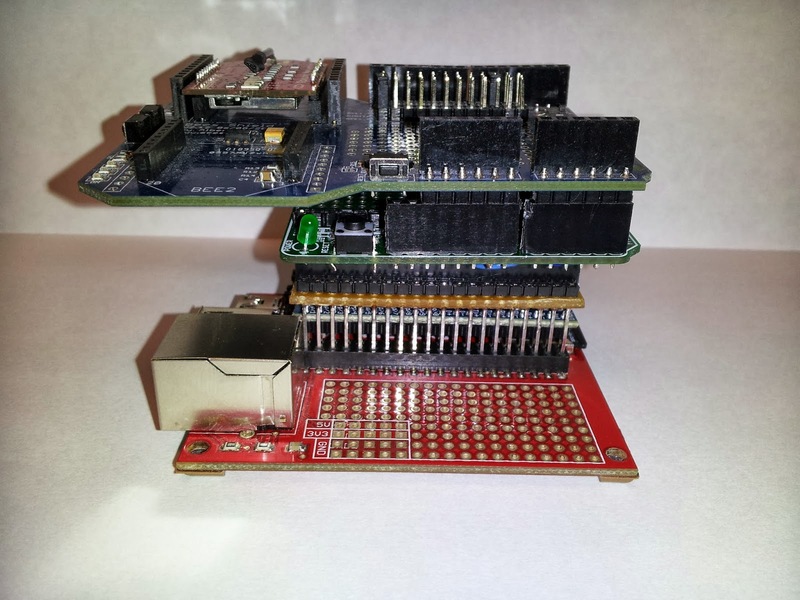 JTAG adapters are commonly used to program and debug microcontrollers and microprocessors. This circuit is a prototype of one that is compatible with OpenOCD which is an open source JTAG program and set of drivers. 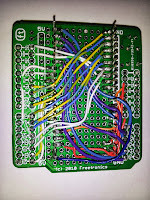 The board and circuit presented here is simply a set of connections, jumpers, and sockets that leverage the FT2232H Mini Module as a USB to JTAG adapter. Four JTAG and/or SWD ports are provided for compatibility with a variety of development boards: 6-pin ST-LINK, 8-pin LPC-Link, 10-pin JTAG, 20-pin JTAG. Using one of two plug in modules, the 10-pin is either 0.05" pitch or 0.1" pitch. 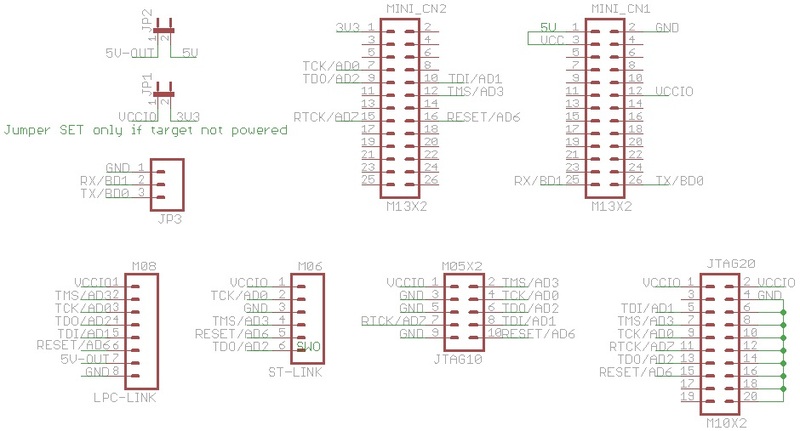 I plan to include both 10-pin formats on any revisions to this JTAG board so I can easily adapt between the formats. When used as a USB JTAG adapter, only one of the JTAG or SWD ports is used. Note that pin 1 is consistently in the upper left on this board. Ribbon cables or socket cables are used to connect to the target board. It is useful to have sets of cables that support all these pin-out formats. Cables are quicker and easier than single conductor jumpers between individual connector pins. 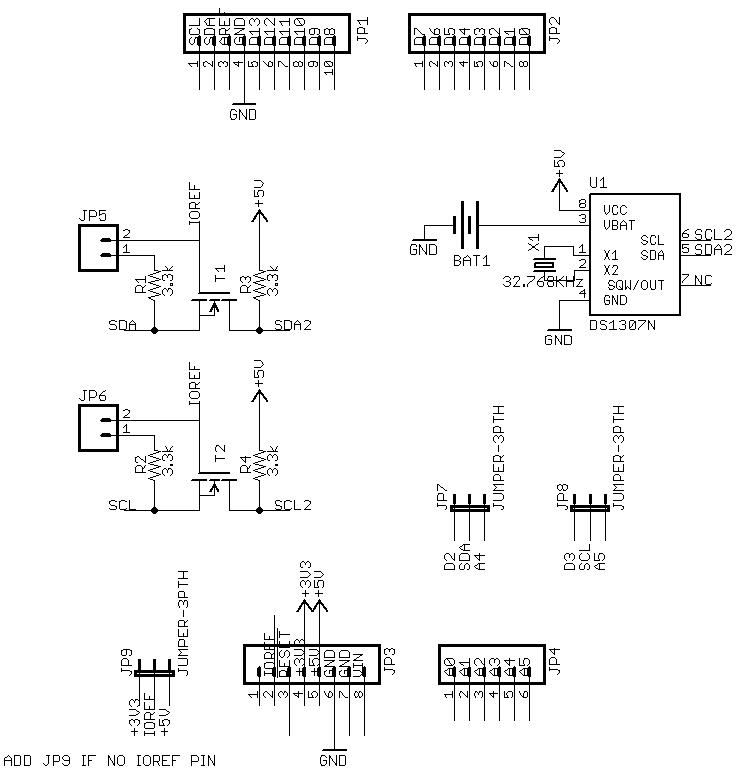 An alternate use is to adapt from one pin-out to another when using other JTAG and/or SWD programmers. In this case the mini module can be removed or simply disconnect the USB cable from the computer. The board is only being used to convert pin-outs. For example, I can use a 6-conductor socket to socket cable to connect the ST-LINK port to the ST-LINK socket on my STM32F4Discovery board, and then connect the LPC-Link socket via an appropriate cable to an LPCxpresso board. 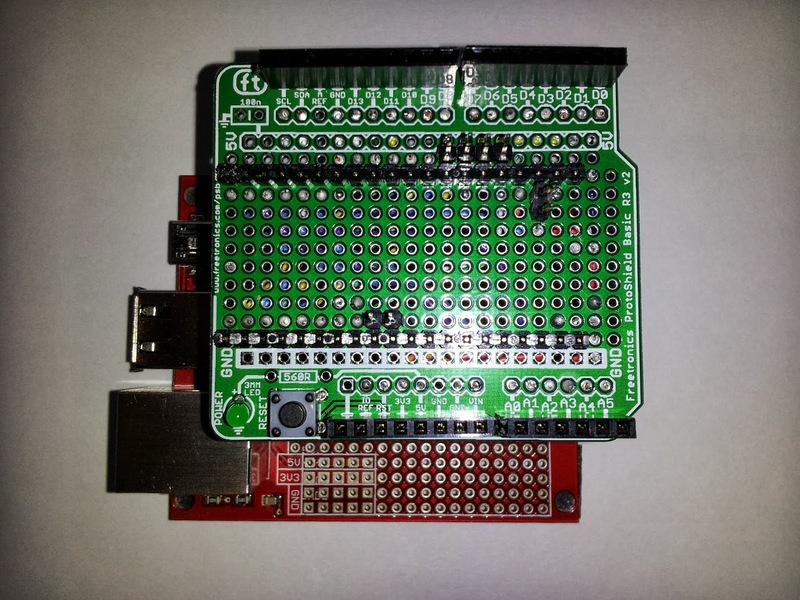 I have used this method to program and debug my LPCxpresso board for LPC1343 with CooCox IDE. Caveats and Warnings. Note that I did not do extensive testing. I am not sure the RESET and RTCK lines are working. Some boards I could only connect to using SWD instead of JTAG. Driver installation and basic use of OpenOCD is not described in this post, so see Getting Started with OpenOCD. Inspiration and References. 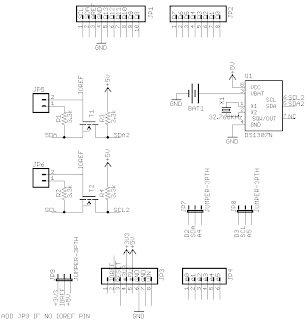 Most of the JTAG circuit is gleaned from multiple FTDI specifications regarding the FT2232H, Mini Module, and related MPSSE Basics Application Note AN_135. And the circuit is very similar to the FLOSS-JTAG one shown here. ST Microelectronics has been supporting their Discovery line of ARM demonstration and development boards for a while now. I was first introduced to the STM32 Value line discovery (STM32-F1), getting a free one at one of the embedded development conferences in San Jose or Santa Clara. I had tucked it away for safe keeping (or hoarding), and over the years also acquired a STM32-F0, STM32-F4, and STM32-F3. These are low cost (most $8-$11, with one at $15 US), and some of the more advanced boards include an accelerometer, gyroscope, or compass and multiple LEDs. 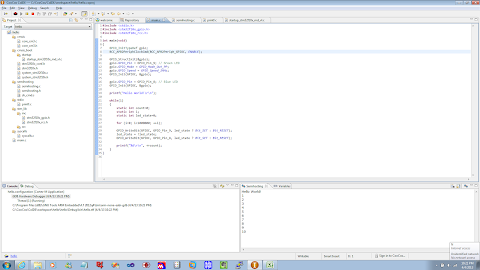 I recently stumbled across the CooCox CoIDE for working with the Simplecortex (I'll blog more about NXP chips and boards another time), and while starting to play with it, discovered that this IDE also supported the STM32 boards. 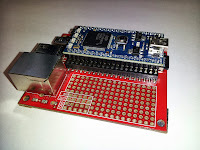 Which is great, as I had just started reading Discovering the STM32 Microcontroller by Geoffrey Brown of Indiana University and wanted to try my hand at developing for ARM in C.
As stated in their tagline, CooCox is a set of "Free and Open ARM Cortex MCU Development Tools." 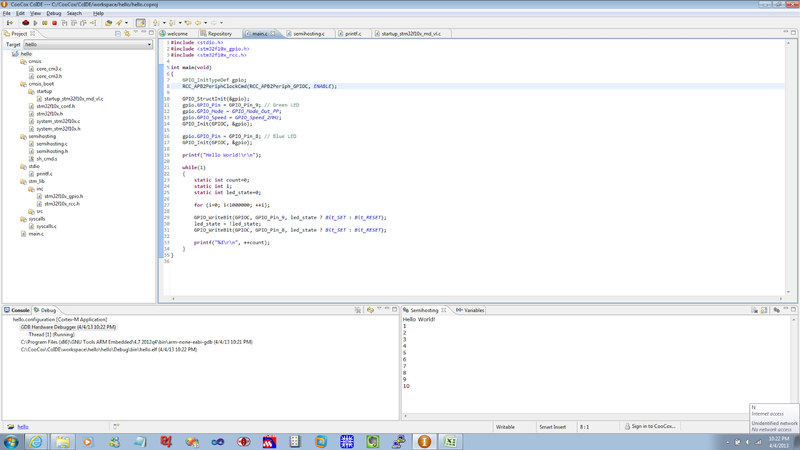 CoIDE is an Eclipse based integrated development enviroment supporting the standard GCC ARM tool set: compiler, assembler, linker, and debugger. The STM32 discovery boards include an embedded ST-LINK or ST-LINK/V2 which is supported by CoIDE for flashing and debugging. The real value add by CoIDE is point and click choice of MCU library modules for various peripherals, with hypertext library references and examples. CooCox supports a variety of ARM Cortex MCUs from various manufacturers. ST is just one of the manufacturers. Here I will show you how to install CoIDE and essential dependencies to develop a simple Hello World program for the STM32 Value line discovery board. The steps are very similar for the other boards (except STM32-F3 is not directly supported at this time). The program will display debug output from printf() through the ST-LINK to the IDE's console window. This is the essential first program to see results from a program running on an embedded board. And it's not just a blinking LED, though we'll do that too. 7. Add #include <semihosting.h> after the other includes.